Any organism which depends on another animal for its existence, food and shelter is defined as a parasite. Since the skin is the most exposed part of the body, a number of parasites can infest it easily. Many parasites are host specific (prefer dogs), while some are accidental parasites (a dog was a convenient choice). In dogs, skin parasites may be different species of mites, flies, fleas, lice and fleas. Mites, fleas and lice are mostly host specific, and may or may not be obligatory (need to jump from host to host to survive, vs. having to stay on one host) so they depend upon dog skin for survival. Flies on other hand are just peripatetic parasites, meaning that they roam around several hosts, and depend of them for food and reproduction, but not for shelter. They also transmit various diseases, which is why they are also called "biological vectors." Mites; Mites are mostly host – specific organisms, roughly round and usually 0.3 – 0.6 mm in length and possess 4 pairs of short legs. They have a distinctive head. Mites usually inhabit a dogs skin, and may only cause the onset of disease if they are a large colony and the immune system of the host dog is suppressed. The mite lifecycle usually takes 17 – 21 days, and may be transmitted to other dogs on contact. It is estimated that every 3rd domesticated dog can be an asymptomatic (has mites but doesn't show symptoms) carrier of mites. A number of mite species can cause skin problems in dogs, like the Sarcoptes scabeie which causes Sarcoptic mange, Cheyletiellosis yasfuri which causes walking dandruff, Demodectic or red mange which is actually an infestation of Demodex canis. A less frequent form of mite infestation in range dogs is called Trombiculosis. 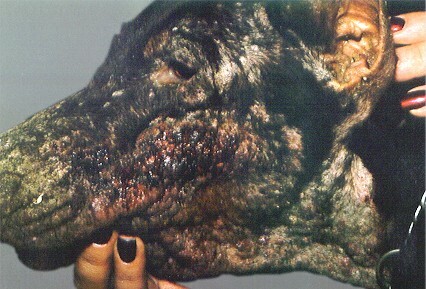 A mange or mite infestation is usually characterized by severe pruritus (itching), skin scars or scales, inflammation, hyper pigmentation & may also cause pyoderma (skin ulcer) in some cases. Fleas; Fleas are compressed, 1.3 – 3.3 mm sized organisms, which depend on the blood of the host. These parasites may or may not be host – specific. Ctenocephalides canis is the most common specie of flea that causes dog skin problems. In dogs, fleas can cause two different forms of disease, flea–bite hypersensitivity and the other is due to an expanded infestation of fleas. Flea–bite hypersensitivity is caused by A histamine like compound, released into the circulatory system while the flea is sucking the dog host's blood. A severe infestation can cause severe itching, irritation of skin, alopecia (hair loss) & then generalized illness. Lice; Anopluras or sucking lice and Mallophagas or chewing lice are two common sub orders present on dog skin. A lice infestation is less common in dogs, but many breeds with long hair are more susceptible. It is estimated that 7.4% of anemia (low red blood cell count) cases in pet dogs are caused by lice. Canine skin parasites are usually diagnosed by clinical examination and by taking a history. Signs of pruritus (itch), alopecia (hair loss), progressive anemia and secondary generalized (spread throughout the body) skin problems may be suspected for dog skin parasites. In most cases skin scrapings are used for a confirmatory diagnosis. Flea – bite hypersensitivity should be differentiated from atopy (seasonal allergy). Similarly pyodermal mange should be differentiated from pyoderma (skin ulcer) caused by bacteria. Treatment involves shampooing with medicated and lathering shampoos. Anti-lice shampoo which also kills ticks and fleas is the only helpful treatment option for this type of dog skin parasite. Lime-sulfur dips such as Dermisil are effective and safe for mange. Anti-flea shampoos such as the one just mentioned for lice are also available for flea eradication. Usually a topical or a localized treatment plan is effective but with caution for skin sensitivity. Regular baths, grooming and nursing can improves the condition. Anti-parasitic drugs are also used for the eradication of dog skin parasites. Ivermectin, Melbemycin, Moxidectin, Selamectin & Nintenpyram are some examples of those drugs. These drugs can have side effects. Other drugs, like anti allergic, corticosteroids & antibiotics are used for flea allergy, recovery and secondary infections respectively.